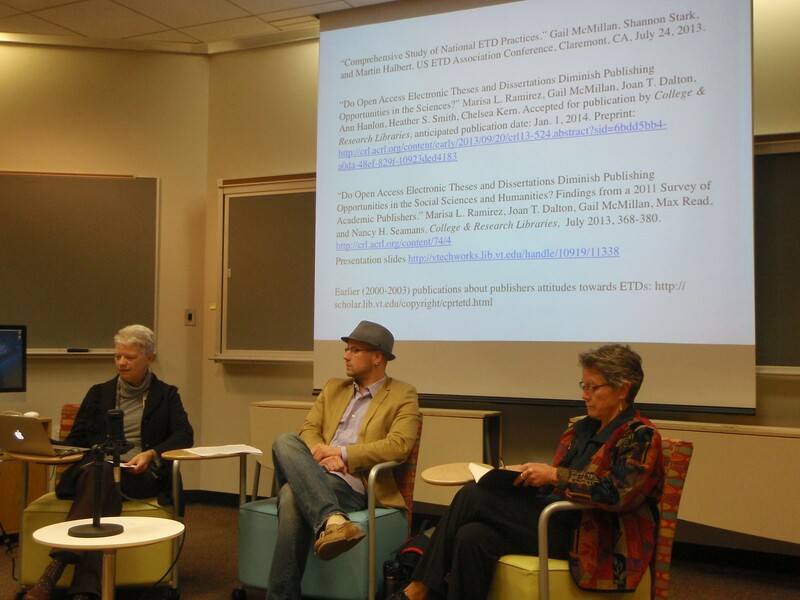 Our first event of Open Access Week 2013 provided plenty of interesting discussion yesterday. “ETDs and Open Access” (ETDs are electronic theses and dissertations) was led by Gail McMillan (Director, Center for Digital Research and Scholarship Services, University Libraries), Jordan Hill (ASPECT Ph.D. candidate), and Karen DePauw (Vice President and Dean for Graduate Education). Gail McMillan began the session with her ETD survey data presentation. One survey queried universities about their ETD policies, and the other surveyed publishers on their willingness to consider revised work based on an openly available dissertation or thesis. About 95% of U.S. institutions have embargoed some ETDs. An interesting finding from the publisher survey was that on the whole, publishers in the humanities and social sciences are actually more willing to consider revised work based on an openly available ETD than science publishers. Jordan Hill gave a brief overview of his own research (an oral history of memorials for mass murders) and the American Historical Association’s statement on ETD embargoes. Given the unique (and less-revisable) nature of his research, he is understandably concerned that its open availability could affect the chances of publication as a book, and therefore his job/tenure prospects. Rather than the 6-year embargo in the AHA statement, Jordan suggested the possibility of a 3 or 4 year embargo. Karen DePauw gave an overview of ETDs at Virginia Tech. The university was the first to require them in 1997, prior to her arrival. A one-year embargo is available to students with renewal possible by request. One exception is a 5-year embargo for those in a Master of Fine Arts program (for creative work such as poetry and stories that would not normally be revised for publication). For those doing classified research, the graduate school requires that the research be publicly defended and some part of the research be made available. These brief presentations by the panelists were followed by an open discussion. I was interested in knowing if any details beyond “case by case” publisher considerations were available (it primarily means a judgement of quality) and the distinction between “published” and “unpublished” (it signifies editorial review). The discussion was pretty wide-ranging, but to me the heart of it is that many early career academics like Jordan support open access but but recognize that it is not rewarded in the criteria for hiring, tenure, and promotion. It is not surprising that despite their approval of openness, they must be conservative and pragmatic in their approach because academic evaluation is not changing as fast as scholarly publishing. Academic success in the humanities and social sciences is currently dependent on monograph publishing (another criticism of the AHA statement), which is in turn dependent on publishers who evaluate manuscripts based on how many books they think will sell. In particular, publishing an academic monograph is dependent on university presses, who in turn are (mostly) dependent on academic libraries to buy books. But libraries are buying fewer books due to the serials crisis (primarily in STEM fields), which puts stress on university presses, who in turn are less receptive to manuscripts from early career academics. In my view, universities and their libraries need to devote more resources to publishing monographs (such as using Open Monograph Press and implementing an external review process) so that academic work can be evaluated on its quality rather than its saleability. In addition, there’s no reason why this can’t work on the freemium model, with the full text available online but print versions for sale, with royalties going back to the author. A big thank you is due to Jordan, Karen, and Gail for this thought-provoking session. Thanks to the University Libraries’ Event Capture Service for the video below [Edit 2/28/14]. Later in the day, Gail and I presented Introduction to Open Access and Copyright. Lots of links inside that presentation for those who want to do some exploration. Interestingly, a graduate student raised similar concerns as Jordan Hill earlier in the day: young scholars are faced with a dilemma between open access and prestige. I pointed out that it’s not always an either-or choice since there are increasingly prestigious open access journals, and self-archiving is a valid option that is often overlooked. But when it comes to getting or keeping a job, it’s hard to fault young academics for publishing behind a paywall when promotion and tenure guidelines reward it. This entry was posted in Open Access Week, University Libraries at Virginia Tech and tagged Embargoes, ETDs, Videos. Bookmark the permalink.